Get hands-on at Beaulieu this February half-term (February 10th – 18th ) and light up the ultimate symbol of luxury, a stunning Lalique car mascot which is part of the glittering centrepiece of the National Motor Museum’s brand new display The Luxury of Motoring. 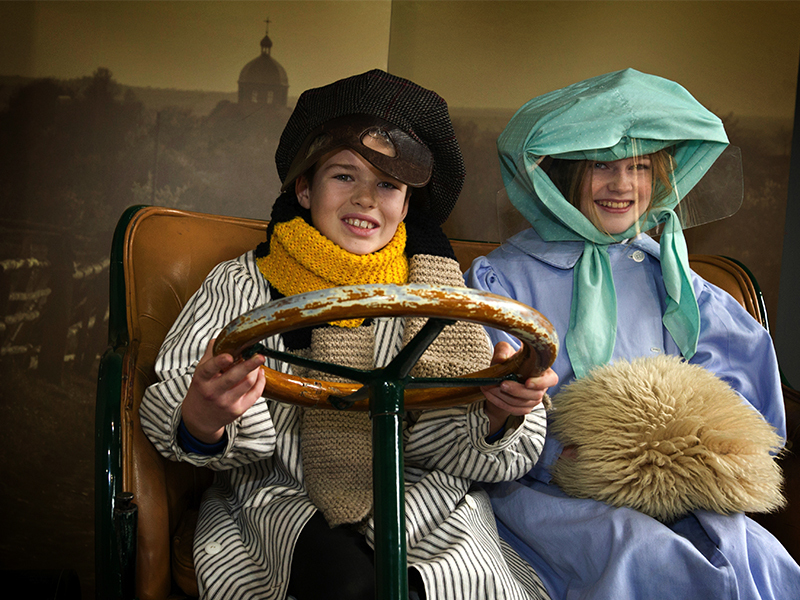 Be creative and design your own car mascot, then make a top hat and dress up in a luxury motoring costume before stepping into a 1904 veteran car for a selfie opportunity. Or why not recreate the striking pose of the Rolls-Royce Spirit of Ecstasy mascot for an unforgettable family album photo? Try horns and handle the motoring artefacts of a bygone era. Then meet Lord Montagu’s chauffeur, Mr Stephens, as he drives around the grounds of the attraction as part of Beaulieu’s living history. Be one of the first to explore The Luxury of Motoring display with its stunning collection of 28 Lalique glass car mascots which will be on show together for the very first time. See up-close some of the most luxurious cars ever built, discover the stories of their design, the people who owned them and the chauffeurs who drove them. Pick up a Hands-On Half-Term Pass Book and fill it with stamps at each of the activity stations around the attraction. Take a pit stop break at the Brabazon Restaurant with a culinary touch experience for children – put your hand in each mystery box and guess what food ingredients are inside. In the Montagu ancestral home of Palace House, take a peek below stairs and gets hands-on in the Victorian Kitchen as Lord Montagu’s cook prepares traditional dishes. Then talk to the costumed guides to find out what life was really like in a Victorian country house. Meet the costumed monk in 13th century Beaulieu Abbey, try your hand at building a medieval arch, then try on a monk’s habit for another selfie photo. For more information about what’s on at Beaulieu for February half-term, see www.beaulieu.co.uk/events/february-half-term. All of the February half-term activities are included in a general admission ticket to Beaulieu, which includes entrance to the National Motor Museum with its collection of more than 250 vehicles from throughout motoring history, the new-look World of Top Gear, On Screen Cars, Palace House, Beaulieu Abbey and the stunning grounds and gardens. Tickets can be bought in advance online. For tickets or more information see www.beaulieu.co.uk or call 01590 612345.